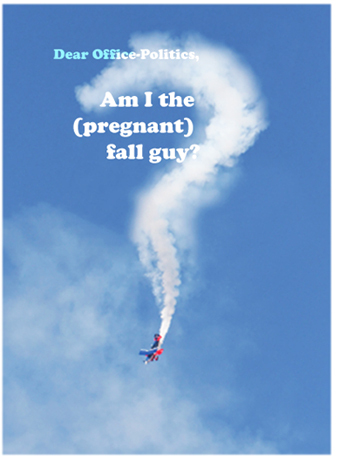 Office-Politics » Am I the (pregnant) fall guy? I took a job 3 years ago with a start-up tech company as a software engineer. Dream job, but my boss turned out to be not so good at business and less good at managing people. The business is losing money like crazy, and worse, my relationship with my boss is souring. I have a coworker with whom I have never worked well despite my best efforts, and he’s threatened to quit if I’m not fired. The boss’ response? To ream me out for “not getting along with others”, despite a reluctance or inability to tell me exactly what the problem with my behavior is or what I have supposedly said or done to offend. As of today I have been told that I may not have any discussion with any co-worker in my department or any other. I must dress “business casual” whereas my co-workers (and boss) may continue to wear t-shirts and jeans or shorts. Did I mention that the office to which we are moving does not have running water or flushing toilets? I’m beginning to think I’m just the fall guy for the company’s financial problems, especially when he can’t come up with specific examples of how I am lacking in my dealings with others. I am no longer being given tasks because I “can’t work with others”, and there is no work to be done that can be done by just me. It’s only a matter of time before I am fired for being dead weight. My second child is due in 3 weeks and I have tons of debt and no savings. My company isn’t subject to COBRA so when I leave, my family will have no health insurance. Therefore I need to keep this job at least until I can find another. Can you help me with some coping skills? Should I stay out of sight as much as possible? Should I request another meeting with my boss and demand his help in improving the situation? Send a carefully worded letter? What can I do? Additionally, if this situation explodes before I have another job, how likely am I to be able to collect unemployment benefits? First of all we have deep empathy for your situation. You face a very difficult work scenario, compounded by the fact that you are about to give birth. There are no panaceas in this type of environment but it is important to cope in a way that can protect you and your family. You will see that a key theme of our advice is to not make things worse and deepen the vicious cycle you are vulnerable to at this point. Our first recommendation is to talk with an employment lawyer. We would suggest this so that you know your rights and available strategies. But the other reason is that some of your questions can only be answered by a lawyer. Maintain a “low profile”. Avoid confrontation. At work we would suggest you maintain a “low profile”. Your chances of hanging on do not sound good but it is to your advantage to stay until you find other role in another company (we assume, and hope, that you are pursuing this as aggressively as you can through your network). In situations like this it is common for people to blame others and then scapegoat people with little power. This may happen anyway but it will be to your advantage to not make it easy for them to do it, e.g. avoid having a confrontation. If we thought a direct confrontation would help we would not be against it, but it doesn’t seem like it would work here. While you are trying to get new employment and not accelerate your departure you will need to take care of yourself, both for you and for your expanding family. Remember when you board a flight and the flight attendant talks about the oxygen masks coming down? He or she is likely to say that you should put yours on first before trying to help your child. The same model works here. We don’t know how you destress and relax but this should be a top priority, both for your health and keeping on an even emotional keel so you don’t have an outburst at work. This could include mild exercise, (when you are able to), stretching, slow breathing or prayer. These are no longer nice to do, these are essential for someone going through the stresses that you are experiencing now. Research on stress management for women, indicates that finding support from other people is even more important, so we hope that you have people that you can reach out to. Thanks very much for the advice. This situation is getting worse and worse by the minute. I’m now having to chase down my paycheck every pay period because the boss “forgets” to bring them to the office, or “they aren’t ready yet”. Last time I had to drive over an hour to pick up my pay, and the person I was supposed to meet didn’t show up for two hours. Worst. Job. Ever. I also have been in touch with OSHA about the new office’s unsanitary conditions. My resume is floating around out there, but there aren’t many jobs that pay what I’m making right now – especially in this area. By the time I’m ready to return to work, I hope to have some leads on contracts. I worked for 10 years as a subcontractor to the government and have a fairly good network of contacts. Once I have enough coming in to pay the bills, I can leave this company from hell. PS. Because more education never hurts, I have also enrolled in a master’s program. Thanks again for taking my letter. I love Office-Politics and read it regularly. Oct 3, 2008: Nancy Zimmerman: a canadian money coach (not a financial planner!) » Blog Archive » Why do people stay in job situations from hell?